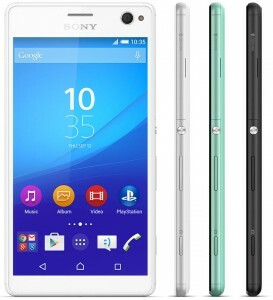 Last week Sony announced that the Xperia C4 and C4 Dual would slowly be out in various markets. And today the rollout for the dual-SIM iteration of the C4 has reached India. The Sony Xperia C4 Dual is thus now available for purchase in the subcontinent. The recommended retail price is INR 29,490, which amounts to approximately $460 or €408 at the current exchange rates. The phone can be bought in white, black, or “mint” color versions. Although this phablet’s specs aren’t all that bad, at that price it’s probably going to be a pretty tough sell, especially for people who don’t care about that front-facing LED flash. If you take away that (arguably unique) spec, the OnePlus One has better hardware and is cheaper. Then again, it doesn’t boast the Sony brand, which might be important for some. The Xperia C4 Dual comes with a 5.5-inch 1080p touchscreen, a 13 MP rear camera, a 5 MP selfie snapper, MediaTek’s MT6752 SoC with a 1.7 GHz octa-core Cortex-A53 CPU, 2GB of RAM, 16GB of expandable storage, and a 2,600 mAh battery. It runs Android 5.0 Lollipop.